Dr. Wayne Marasco is a world-renowned antibody engineering expert who works on infectious diseases and cancer immunotherapies. Dr. Marasco’s laboratory has developed one of the largest human antibody phage display libraries ever made (with tens of billions of members). For cancer, as well as HIV/AIDS and other infectious diseases, one possible treatment involves the use of human monoclonal antibodies (Mabs) – which are proteins that are produced to bind to only one substance. For cancer treatments, Mabs bind only to cancer cells and produce immunological responses against the cancer cells. There is great promise with Mabs because their tumor-fighting effects would be less harmful to normal cells than that of traditional cancer treatments. 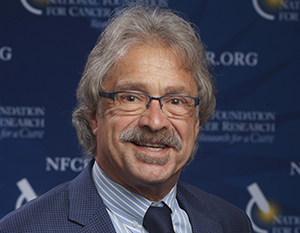 In an effort to greatly expand the use of Mabs in the treatment of cancer, Dr. Marasco and NFCR founded the NFCR Center for Therapeutic Antibody Engineering. He collaborates with accomplished global cancer investigators in a joint effort to uncover new Mabs using his laboratory’s human antibody library. Dr. Marasco has had great success developing Mabs that attach to an important protein – carbonic anhydrase IX (CAIX) – that is highly expressed in renal cell carcinoma, the most common type of kidney cancer. Once attached, the CAIX antibody can halt abnormal cancer growth. Most recently, his team at the NFCR Center developed a combination immunotherapy treatment that holds promise for treating metastatic kidney cancer more effectively. The immunotherapy they have engineered includes not only the CAIX antibody that detects and binds to CAIX growth-promoting proteins on cancerous kidney cells, but also unblocks T cells to enable more rigorous attacks against cancer. Moreover, this double treatment approach could be adapted to treat advanced colon, breast, brain and other difficult-to-treat solid cancers using different antibodies. Wayne Marasco, M.D., Ph.D., studied at the University of Connecticut’s School of Medicine, where he received his Ph.D. in 1980. He conducted his postdoctoral training at the University of Michigan Medical School, where he also earned a M.D. in 1986. He received his sub-specialty training in infectious diseases at Harvard Medical School, where he is currently a professor, and he joined the Dana-Farber Cancer Institute in 1989. In 1992, he also joined the Division of Infectious Diseases at Brigham and Women’s Hospital. In 1980 and 1981, Dr. Marasco won the Biomedical Research Council Award and the National Research Service Award from the University of Connecticut School of Medicine, and the University of Michigan awarded him the United States Public Health Service Award in 1981, the Dean’s Award for Research Excellence in 1986 and the Lung Immunopathology Training Grant Award in 1987 and 1988. In 2003, Dr. Marasco became the Director of the NFCR Center for Therapeutic Antibody Engineering to expand the use of human monoclonal antibodies in the treatment of cancer. In 2009, U.S. News & World Report listed Dr. Marasco as a “Medical Pioneer” and a top scientist in his field. In the same year, Dr. Marasco was selected as a Distinguished Speaker by the Walter Reed Army Institute of Research. Your ticket for the: Wayne Marasco, M.D., Ph.D.